As we continue to shift away from nonrenewable energy sources, others continue to take the stage. So far, the most popular alternatives by far have been wind and solar. As you can see in the chart below, wind and solar are the only sources of energy that saw additions every month last year. And in some months, they grew even more than natural gas, the primary nonrenewable energy source. There are a couple primary reasons for this giant shift. One is the obvious advantage that they are renewable. We’ll never need to worry about a shortage of wind or sun. Even if the wind stops blowing for a couple days or there’s cloud cover, these energy systems store energy from the sun and wind to use for the days and weeks ahead. 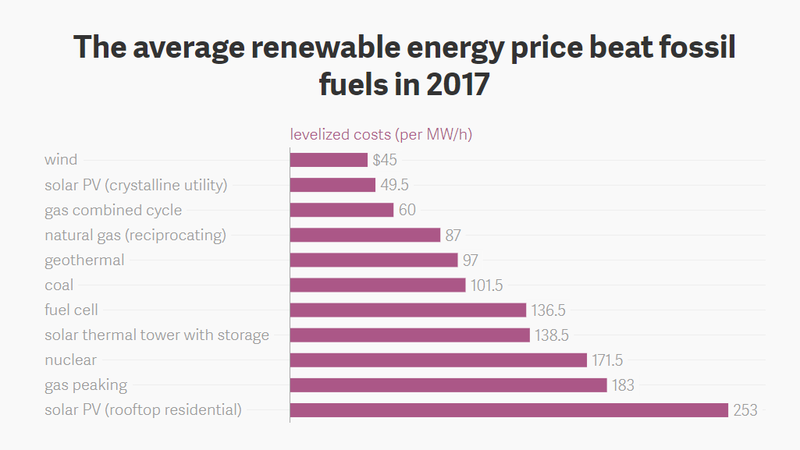 The other reason is the sharp decline in cost for these alternative energy sources. It’s now about 50% cheaper to power something from wind than it is for natural gas. Solar is getting to that level as well. At the end of 2016, an estimated 1.3 million homes were powered by solar, and that number is expected to grow to 3.8 million by 2020. And it’s also estimated that 332 households can be powered for one year by just one wind turbine. An easy way to invest in renewable energy sources like wind and solar is through the iShares Global Clean Energy ETF (Nasdaq: ICLN). This exchange-traded fund covers a wide variety of alternative energy companies around the world. As these methods of power consumption continue to grow on a global scale, this ETF, as well as the stocks in it, should see high demand from investors.